Jellyfish, venom, scicomm, grad school, etc. On 3 December 2018, the first jellyfish genome was published online at Nature Ecology and Evolution. To clarify, the is the first genome of a cnidarian with a jellyfish stage (i.e. medusa). There are currently a few other jellies, like Hydra and Nematostella, that have had their genome available for several years. What was the lucky medusa-bearing species? Aurelia aurita (species 1 complex), the Moon Jelly. Moon jellies are a commonly encountered species around the world, and probably one of the first jellies most folks can easily picture in their head; a stout, translucent jelly with short tentacles and the charismatic clover-leaf pattern on the top of their bell. They are ubiquitous in aquariums that care for jellies, and are the most common jellies kept as pets (not including corals or anemones). Moon jellies are also common in biological research, with several laboratory strains (including Roscoff and Eilat) used for studying nervous system evolution and cellular regeneration. If you have taken an introduction to zoology course, you have probably seen the Aurelia life-cycle in your textbook. To celebrate the release of this genome, I thought I would take a closer look at what we understand about the venoms of these common jellies. Since these species are found across the globe, they are also a common jelly for beachgoers to “interact” with, as well as researchers and aquarists that work with these animals on a near-daily basis. Needless to say, Moon jellies have likely stung their fair share of humanity. But as you can imagine, these animals would not have become so common in aquaria or labs if they were truly dangerous. 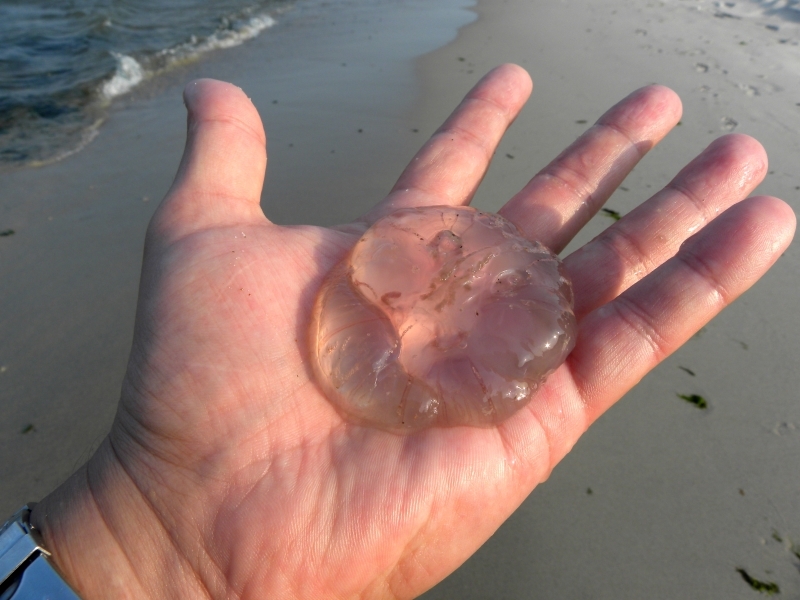 In fact, I could only find two reports of these jellies causing major health issues. One is a case report in 1988 by Burnett et al of a 30-year old marine biologist experiencing local skin irrational and pain for over a week after being stung by “an unusually large” A. aurita. The second case is also a sting by a “quite large” A. aurita on a 25 year old man diving in Florida, which cleared up 8 days after treatment with medication (Simmons et al 2014). While generally considered harmless, there have been incidences of massive jellyfish blooms around the globe that have caused health problems simply out of shear numbers, including reports from stings in the Caribbean, Spain and Israel (Mariottini and Pane 2010). 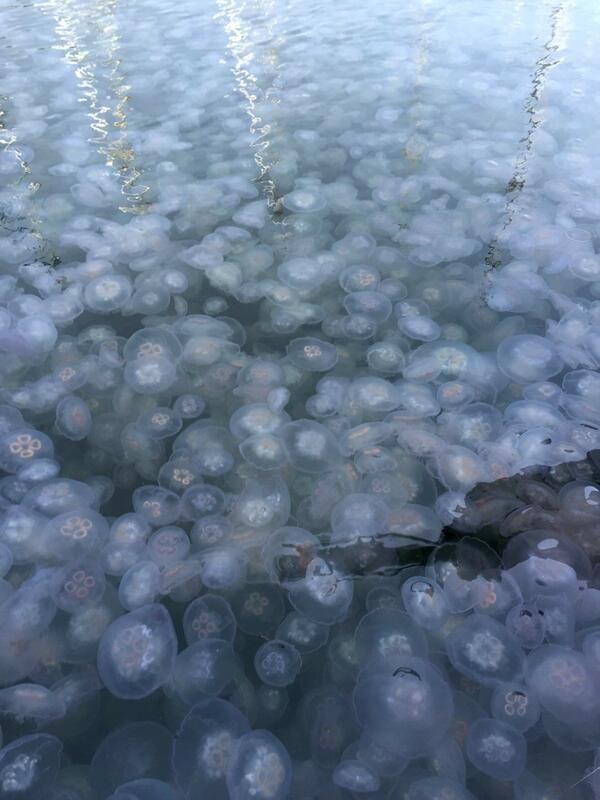 Just this year over 2,000 people were reportedly stung by Moon jellies in Florida, though there were no major injuries. Even though a single sting from one individual is relatively benign, in a large number of jellies (called a bloom or a smack), these animals can pack a more powerful punch. Most of the time these animals only cause some itchiness, but moon jellyfish stings appear to be highly variable, and we have no idea why that variability occurs. So, what do we know about moon jelly venoms? Though studies are sparse, crude venom from Aurelia has shown to be dermonecrotic and display vasopermeability and hemolytic properties (Mariottini and Pane 2010). Basically, their venom attacks skin and blood. Crude venom also displays phospholipase A2 activity (Radwan et al 2001), which is a common toxic component in animal venoms (and typically cnidarians) that can cause a range of myotoxic and neurotoxic effects (i.e. they burst open cells and fry your neurons). Phospholipase A2 transcripts (evidence of gene expression) has also been found in the nematocysts content of Aurelia, as well as evidence of highly potent pore-forming toxins from a nematocyst proteome (Rachamin et al 2014). Other proteolytic (protein busting) properties have been found in crude venoms as well (Pong Prayoon et al 1991;Lee et al 2011) and recently neurotoxic activity has been characterized in vivo (meaning in a living organism) using crab models (Ponce et al 2013). There is even a study from Japan showing that venom from Aurelia collected in the Truk Islands of the Federated States of Microneasia completely and irreversibly blocked muscle contraction in frogs (Kihara et al 1988). All of these toxins and toxic properties are common bioactive properties of venoms, but what about specific effects on humans? Work on Mexican Caribbean A. aurita showed that extracted venom from tentacles was equally hemolytic to human, sheep, and bovine erythrocytes at low doses but was more toxic to human cells at higher doses (Segura-Puertas et al 2002). In fact, these hemolysins appear just as potent as hemolysins isolated from sea nettles, which are generally thought to be more dangerous to people. Strangely, hemolysins from sea nettles are equally potent to human erythrocytes as sheep (Segura-Puertas et al 2002), suggesting the mechanism is somewhat different from the Aurelia hemolysin. So, what is the deal? Is the mechanism of these hemolysins really that different from sea nettles, or is there perhaps simply a lower dose of hemolysin in Aurelia, by virtue of having smaller tentacles than the sea nettle, lending to a smaller effect? And are these toxins specifically targeting humans? Shouldn’t this evidence indicate that moon jellies are dangerous? The truth is that many of these components are common in most venoms, but almost all are very specific for species of invertebrate and vertebrate prey, sometimes even specific stages. In the same study in the Mexican Caribbean, fractions of venom that were lethal to crabs in about three minutes affected instar II and III Artemia nauplii only after five hours, and instar I nauplii were hardly affected at all. These jellies venom, which as a reminder was found to be the most harmful to human cells compared to other species, was also the venom fraction that was most lethal to crabs (and assumingly Artemia), but that same venom is not effective towards the earliest stages of Artemia. This suggests that some of these individuals or perhaps this population of jellies in the Mexican Caribbean might just be more toxic in general, by either genetic chance or adaption to their environment. So while Moon jelly venom sounds scary and all individuals contain some dangerous compounds, that doesn’t mean that all moon jellies will hurt you. Venom often evolves meticulously for exactly the prey and/or predators that jellies (or any venomous animal) interacts with. And humans are not prey or predator to jellies, at least not in their native marine environment. There has also been some recent work that suggests it might not even be envenomation from contacting tentacles that is causing problems. 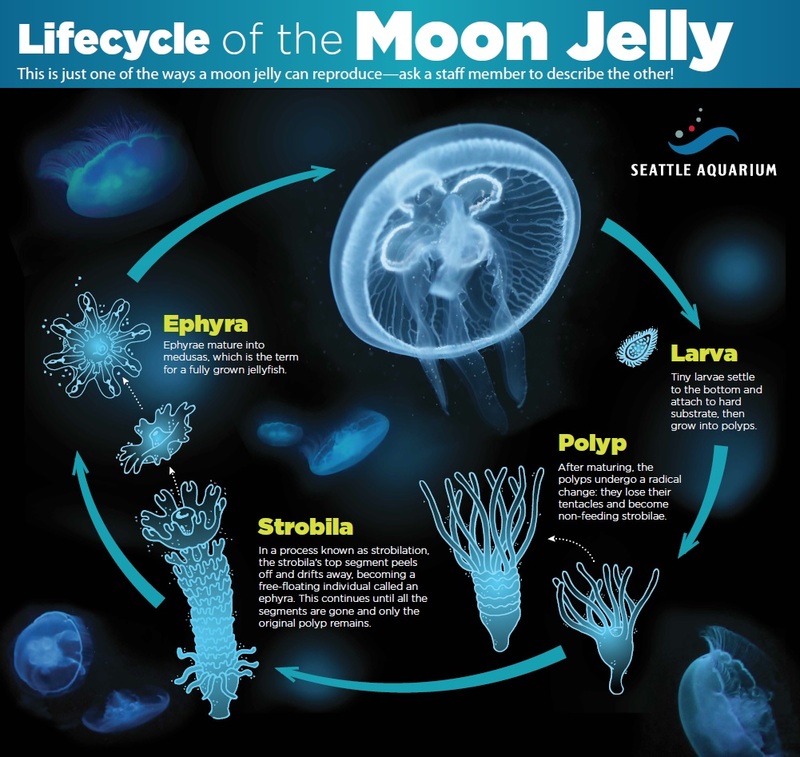 The mucus released by moon jellies has been shown to contain enzymatic compounds that can potentially cause a sting without having to touch the jellyfish at all (Lui et al 2018). This is likely a natural defense since mucus production is usually induced by a physical disturbance or general stress. Fisherman that touched “residual water” on their nets after going through a bloom of jellies have reported skin irritation and local swelling (Lui et al 2018). Cnidarian mucus is an understudied field that could prove valuable for discovering novel bioactive compounds and aiding in public health efforts, as well as understanding the ecological roles of jellies that produce mucus regularly as a stress response. Perhaps there are other industrial uses of mucus, such as breaking down oil (see this article to learn more). Moon jelly releasing mucus, which has the ability to break down oil (black droplets in mucus. I owned large Aurelia from Florida (they are featured on the logo for this blog! ), and have comfortably, if not awkwardly, moved them into new tanks with my hands. Sure, they are stinging me, and yes, maybe I have a high pain tolerance from too much stress baking in college without oven mitts, but the fact is usually these animals are generally not a problematic jellyfish for people. But that still doesn’t answer why moon jelly venom is so variable in terms of human envenomation. I do have a couple of ideas based on other venomous animals. It could be due to the size of the jellies, which may represent a shift in diet from small zooplankton to larger, vertebrate prey. This has been shown to occur in other venomous animal, like snakes and spiders, which shift their venoms as they switch prey types. And it would make sense based on the two medical cases described above. In fact, Simmons et al (2014) suggests that larger jellies may have larger stinging cells, which may deliver more venom. 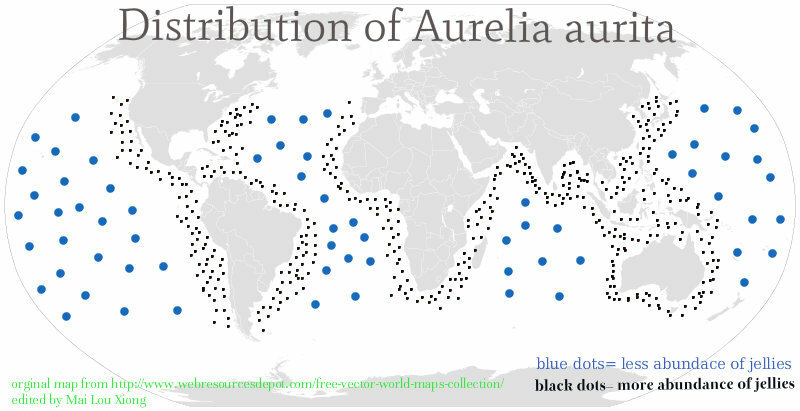 But another study on Old World (Red Sea) and New World (Chesapeake Bay) Aurelia found that the Old World species were more toxic than their New World counterparts. So maybe it isn’t size, but specific species or subspecies in certain areas. Or maybe there is something about the different locations that is shifting venoms to greater potency. But what is it about their local environments that causes this difference, especially towards humans? Perhaps there is simply a difference in ecological and environmental conditions that cues for more potency. Maybe there is also a genetic component that makes these particular animals more toxic. And what about polyps? How does their venom compare, both in composition but also in function? Does a polyp need hemolytic toxins if it isn’t trying to eat any vertebrates that have blood? What happens to venom of strobilating polyps or ephyrae, which don’t even eat? Studies utilizing the recently released genome could help answer some of these questions, and in fact what I am hoping to research during my graduate work. Not only is the release of a jellyfish genome a huge advance for evolutionary genomics, but also towards a better understanding of a commonly problematic species in our oceans. A. aurita (and other Aurelia species) are often responsible for major infrastructure disruptions, including shutting down nuclear power plants (e.g. CBC News). A reference genome allows ecological researchers to do population and environmental studies, which can be complimented with genetic work. A genome acts like a huge platform on which to overlay gene expression data (transcriptomes). Plenty can be done without a genome (there is TONS of research on a multitude of animals that don’t have a reference genome), but it does make it easier and more reliable for some experiments, such as looking at how different environmental conditions affect jellyfish reproduction and blooming behavior. A genome is also useful for telling you what genes are close to another, which can be very helpful if you are trying to understand what genetic cues match to certain genes. Often gene expression data can not give you that answer directly. Further research may also help us understand the genetic mechanisms behind large bloom events, leading to more robust methods for predicting these behaviors. We do not currently have good ways to manage moon jelly blooms. Though, some have suggested jellyfish consumption may be a good option. If you can’t beat it, eat it! Right? Researchers in Denmark have developed ways to prepare “jellyfish chips” as a more palatable way to consume jellies (see my article on the KU EEB Outreach blog), though jellyfish have been consumed for decades already in asian cultures. It is unlikely that our own consumption of jellies will aid in the potential (though unsubstantiated) rise of jellies in the oceans. This ends my ode to Moon jelly venom, but I am hoping that in the years to come more research on the toxicity of these animals will be completed. Burnett, Joseph W., Gary J. Calton, and James B. Larsen. “Significant envenomation by Aurelia aurita, the moon jellyfish.” Toxicon 26.2 (1988): 215-217. Gold, David A., Takeo Katsuki, Yang Li, Xifeng Yan, Michael Regulski, David Ibberson, Thomas Holstein, Robert E. Steele, David K. Jacobs, and Ralph J. Greenspan. “The Genome of the Jellyfish Aurelia and the Evolution of Animal Complexity.” Nature Ecology & Evolution, December 3, 2018. https://doi.org/10.1038/s41559-018-0719-8. Kihara, Hiroshi, Mitsuo ANRAKU, Motonori OHNO, and Saburo HASHIMURA. “Tetrodotoxin-unaffected depolarization of frog muscles induced by the venom of jellyfish (Genus aurelia).” The Japanese journal of physiology 38, no. 6 (1988): 839-849. Lee, Hyunkyoung, Eun-sun Jung, Changkeun Kang, Won Duk Yoon, Jong-Shu Kim, and Euikyung Kim. “Scyphozoan Jellyfish Venom Metalloproteinases and Their Role in the Cytotoxicity.” Toxicon58, no. 3 (September 2011): 277–84. https://doi.org/10.1016/j.toxicon.2011.06.007. Liu, Wenwen, Fengfeng Mo, Guixian Jiang, Hongyu Liang, Chaoqun Ma, Tong Li, Lulu Zhang, et al. “Stress-Induced Mucus Secretion and Its Composition by a Combination of Proteomics and Metabolomics of the Jellyfish Aurelia Coerulea.” Marine Drugs16, no. 9 (September 18, 2018): 341. https://doi.org/10.3390/md16090341. Mariottini, Gian Luigi, and Luigi Pane. “Mediterranean Jellyfish Venoms: A Review on Scyphomedusae.” Marine Drugs8, no. 4 (April 4, 2010): 1122–52. https://doi.org/10.3390/md8041122. Ponce, Dalia, Estuardo López-Vera, Manuel Aguilar, and Judith Sánchez-Rodríguez. “Preliminary Results of the in Vivo and in Vitro Characterization of a Tentacle Venom Fraction from the Jellyfish Aurelia Aurita.” Toxins5, no. 12 (December 6, 2013): 2420–33. https://doi.org/10.3390/toxins5122420. Rachamim, Tamar, David Morgenstern, Dikla Aharonovich, Vera Brekhman, Tamar Lotan, and Daniel Sher. “The Dynamically Evolving Nematocyst Content of an Anthozoan, a Scyphozoan, and a Hydrozoan.” Molecular Biology and Evolution32, no. 3 (March 2015): 740–53. https://doi.org/10.1093/molbev/msu335. Radwan, Faisal F.Y., Joseph W. Burnett, David A. Bloom, Tracy Coliano, Mohyee E. Eldefrawi, Holly Erderly, Laure Aurelian, Monica Torres, and Edgar P. Heimer-de la Cotera. “A Comparison of the Toxinological Characteristics of Two Cassiopea and Aurelia Species.” Toxicon39, no. 2–3 (February 2001): 245–57. https://doi.org/10.1016/S0041-0101(00)00121-5. Rastogi, Akriti, Sumit Biswas, Angshuman Sarkar, and Dibakar Chakrabarty. “Anticoagulant Activity of Moon Jellyfish (Aurelia Aurita) Tentacle Extract.” Toxicon60, no. 5 (October 2012): 719–23. https://doi.org/10.1016/j.toxicon.2012.05.008. Segura-Puertas, L., G. Avila-Soria, J. Sánchez-Rodríguez, Ma E. Ramos-Aguilar, and J. W. Burnett. “Some toxinological aspects of Aurelia aurita (Linné) from the Mexican Caribbean.” Journal of Venomous Animals and Toxins 8, no. 2 (2002): 269-282. Previous Previous post: Spooky Science and Girl Scout Expo!